Looking For Custom Invitation Templates? We offer custom colored invitation templates for clients who are looking to match a certain color palette or party scheme. We also offer complete graphic and illustration design, or Printable invitations designed from your own graphics. You name it, we can create it! Did you come across one of our templates that is almost perfect but you wish it were a different color? No problem! We can happily accommodate your needs. Complete color customization will cost an extra $25 per kit, plus the cost of the kit or ala carte items. After you have placed your order we will send you some color sample palettes to choose from. We will work with you to find the perfect set of colors to work with. Once we have your color choices we will create a sample proof copy of your template in it's chosen color. With your go ahead, we will go ahead and create an interactive template for you. 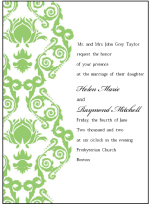 For an extra fee you can even have the text designed into your invites for an easy print and go invitation. Most any customizations you could think of we can create for you. Pricing is worked out on a case by case basis but we will be happy to give you a price quote or send out a Paypal invoice for you! Please fill in the forms below and we will get back to you shortly. We look forward to working with new clients! Do you have an idea for an invitation but cannot find anything like it anywhere? We love to help! Describe your ideal invitation or illustrations to us and we can create a printable invitation set, or custom invitation templates for you. These templates would be completely customized right down to the sizing. Because every custom invitation suite would be different, prices will vary greatly as well. Ball park prices range from $75.00 up to $300 or more depending on the size of the kit and the difficulty and detail of the illustrations. To start a conversation about what your perfect custom invitation would look like, or what you would like to have designed for you please fill out the forms below and we will get back to you. place an order send me a paypal invoice! Custom Coloring? - Describe your colors, please.